"This squirrel is a huge jerk!" Leaves blog singing "Come to the cabaret"
Squirrels are my favorites, even when they act "nutty." Lol! OMG how does it stay on the window pane? I can see it being a real pain for you all! Ha ha! One against two - poor dogs! Squirrels are just rodents with bushy tails. He is an acrobat. Nice picture. I feel a squirrel stew coming on! Hahaha! Good post; perfect caption for a great photo. An excellent fit for today's 'T' A to Z post. Thankfully our squirrels stick to taunting the dogs from the trees around here. I am sure I would be out of windows in my house if they pulled that here. hilarious photo! 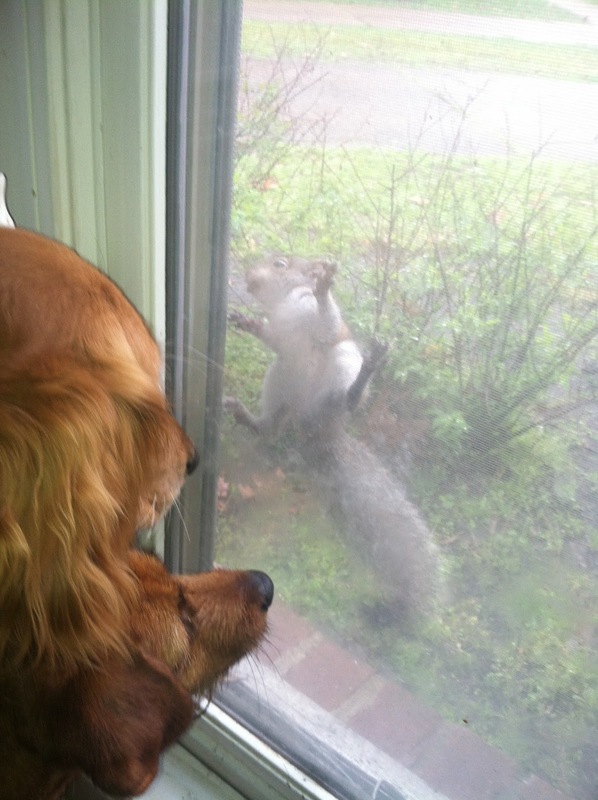 you know the squirrel is thinking, "This screen and window better hold up!" just found your blog and will be back to read more! Ha! I took a photo of a squirrel mooning me this weekend that will eventually show up on my WW. The dogs are looking on with amazement! Great shot! Thanks for hosting. They'd better take those tiny, cute paws away from your window, right? WOW what a brave little sucker!! They can be such a tease! Ha ha, that is so hilarious! We just watched the movie Up! the other night. To distract the dogs they just had to say, "Squirrel!" That is hilarious! Mean old squirrel! Oh... I know thee feeling, at our old place we use to have them and well... No comments. LOL What a GREAT photo!! LOL This is a GREAT photo!! Haha!! This must be the funniest WW picture I've seen all day!! Love it! I love squirrels. This is the first time I've seen one in a taunting pose. Looks like he is keeping the dos entertained. Great photo of that saucy squirrel. We have a few of the cheeky creatures around here, too. Always ransacking the feeder and making nuisances of themselves. We even had a family in our attic once. That was fun trying to get them out. That rascal!! I'm sure it was torturing your dogs! Love the way the dogs are eyeing it. Ugh. Squirrels can be so destructive. Did you take this photo? Hilarious! Posting to FB to share. oh my! those squirrels are crazy!!! LOL, your dogs are showing GREAT restraint!! Yes, he is definitely taunting your dogs! Great picture. Well, it looks like they are all having a little fun. LOL! I hope the dogs don't break the window trying to get that squirrel! Hahahaha! There's a tree coming up to my second story apartment window and the squirrels are always taunting my dogs! Hahaha what a great shot. Your poor dogs much have been going crazy. That squirrel is a tease. We use to hang a bird feeder near our dinning room window for the kids when they were small and we had (maybe still do) this one silly squirrel that would jump to the window AC then to the feeder and sometimes when he got done he would stick himself to the window screen just like your pictured squirrel. The kids simply loved it! It was rather funny Thanks for reminding me of a memory lost. Have a happy week & thanks for joining my WW party! That is such a cute and funny photo! #AtoZ Meets #WW: Z for Zombies!